Whippletree Cottage, The Engine House and Wharfingers Cottage each have a fully fitted kitchen area with oven/hob, fridge/freezer, dishwasher and microwave. You will find a digital TV, DVD player and CD player for your use in the living room. WiFi is available in all three cottages. There is a hairdryer in each cottage. 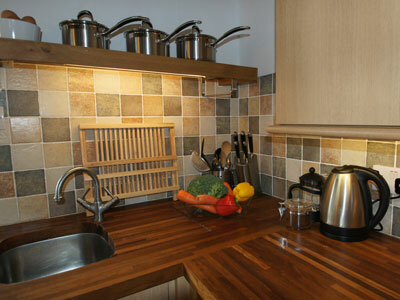 Heating is supplied by a wood burning stove and the luxury of underfloor heating throughout. The underfloor heating is fired by a geo-thermal heat pump providing eco-friendly energy. A complimentary basket of logs is supplied for the fires, further supplies are available at a cost of £5 per basket. A warm welcome awaits you with a cream tea on arrival. Tea, coffee, sugar, scones, clotted cream and home made jam. All produce is organic, produced locally or homemade. 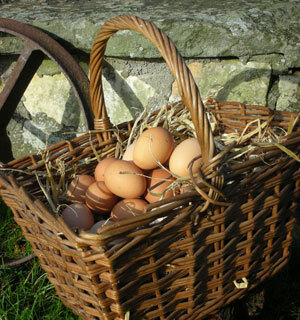 Fresh free range eggs from our hens are available when they are laying. Groceries can be delivered to your cottage, just shop online at the supermarket and have them deliver to your cottage after 4pm on your day of arrival. Tesco and Sainsbury are nearby. Farringtons Farm Shop, which sells locally produced organic food is only four miles from your cottage and provides a wonderful showcase of locally produced food with additional shops and a petting farm for children. There is a garden area to the rear of each property from where you can admire the views and relax. Wooden garden chairs and a table are provided. The Piggery in the courtyard houses the laundry, sink, washing machine, tumble dryer and clothes airer. Guests have use of the iron and ironing board in The Piggery. There is no charge for the use of these facilities. Guests have the use of additional fridge/freezer space in The Piggery. The rental charge also includes the cost of 100% cotton bed linen together with a large bath towel and a small hand towel per person. We have a high chair, bed guard, stair gate or travel cot which guests are welcome to use. These should be booked in advance to ensure they are available. There is no charge but guests are asked to bring their own bed linen for the cot. There is ample, secure parking for vehicles in the courtyard, adjacent to the front and rear of the cottages. It is possible to enjoy the events of the farming calendar as the work goes on around the farm. However for those who wish to relax in the peace of the countryside, rest assured that you will not be disturbed, as most of the heavy work takes place at a different location. There is a no smoking policy in all the cottages. However it is possible to smoke outside the building provided cigarettes are safely extinguished. Unfortunately we are unable to welcome dogs. We do not allow the use of candles inside any of the properties. Please see our access statement for full details of room measurements etc. For that extra special treat why not try our Rustic Romance package to celebrate your anniversary, birthday or other special event. Gift vouchers are available in any sum towards the cost of a stay at Withy Mills Farm. A wonderful gift to say thank you or congratulations. Just let us have the name of the intended recipient and we can send them a gift voucher together with information about their stay, a copy of Bath and Beyond and a local map of the area.